Why do you have to pay for third party bloatware only to have floating events? Event Floater is my answer to this question. Event Floater does and only does what it's supposed to do: make floating events in the built-in Calendar/Date Book. You don't need any additional databases. After installation, you can find "Event Floater" from within Prefs. Just set up the trigger time and the format prefix for floating events. Simply remove the prefix to make events plain appointments. It's like checking the completion box in Tasks. For example, "* Finish My Article." will float from one day to another until you remove "*" from the title (i.e., "Finish My Article"). 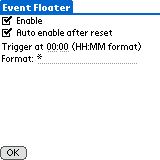 In OS 4 or below, Event Floater is triggered at the specified time. If 00:00 is given, it will be triggered 60 seconds later (at 00:01) to make sure of date change. After then, it will run every 24 hours. If you're in Calendar, Event Floater will wait for you to exit to prevent potential conflicts. In OS 5, setting the trigger time to 00:00 lets you use the notification manager for database update. That is, whenever you launch/quit Calendar/Date Book, Event Floater "immediately" moves past floating events to today. If time other than 00:00 is given, it behaves exactly the same as in OS 4. Setting to 00:01 is basically the same as setting to 00:00 in OS 4 because of the 60 second delay. Whenever Event Floater is periodically launched in sleep mode, LCD will wake up and go off after some time. The job is not completely hidden from the user. Notification events that Event Floater uses are supported only in OS 5. 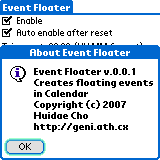 Event Floater is freeware. USE IT AT YOUR OWN RISK! Setting alarms for Calendar/Date book in Event Floater does not work! Fri Apr 5 13:33:12 2019 . XHTML . CSS (lightbox.css is not part of Uniqki. ;-) . Powered by Uniqki!